Increased yields, savings in time, reduced runoff, precise application of nutrients and seeds are all ingredients of precision agriculture, which is setting up farmers for future success. With the price of inputs on the rise and margins thin, a farmer’s productivity has never been more important. Precision ag dates back to the 1970’s when laser controlled graders and scrapers were used in broad-acre operations for cotton and wheat farming. Unitl only 15 years ago was the first GPS constellation NAVSTAR made available for non-military use. Initially, accuracy was only within a number feet but now is within the inch. Today’s technology allows farmers to operate a variety of machines with little-to-no user interaction. Most systems provide all steering for the operator by picking up coordinates from GPS satellites. 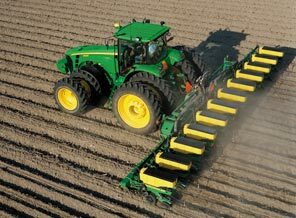 Having your large equipment making precise turns, rows and applications will save your operation time. Most notably in planting, spraying and tillage work. A reduction in the amount of seed, pesticides, fertilizer and fuel can be a big money saver. With the equipment mostly steering and operating on its own, extra experienced help is not a necessity. There are a number of benefits coming from precision ag which reduce the producer’s environmental impact. Pollution and runoff are reduced by applying fewer chemicals; in fact some systems are so sophisticated that it will automatically apply more or less product as needed. Certain systems have the capability to alarm the producer of having proper wind and temperature conditions. The soil also benefits by having minimal disturbance. The future of precision ag will continue to focus on improving its user friendly interface allowing more producers to adapt. Telematics will soon allow producers to monitor machinery conditions including location, fuel consumption, speed, direction and potential maintenance all from their phone. Information on everything from planting to harvest will be available instantly. Even further into the future there is talk about remote control capability. It sounds crazy, but you could someday plant from home. As ag technology moves forward, farmers will become more and more reliant on precise statistical information allowing their operation to increase in efficiency while delivering productive yields. This entry was posted in Education and tagged efficient, environment, Land Stewardship, Precision Agriculture, yields.